Chateau del Mar – 605 Paseo del Mar Illegal Detox Center? Anyone with information regarding 605 Paseo del Mar reportedly being converted into a business to charge tenants for occupancy within drug & alcohol treatment business please should E-mail neighbor@605paseodelmar.com with legally permissible information. If you are considering employment by Desire Kocarslan or Selin Uzumcu at one of their facilities in Palos Verdes Estates, Torrance or Lomita, I strongly encourage you to review this website first. 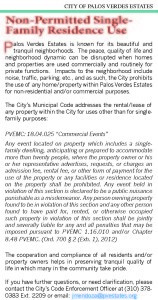 The City of Palos Verdes Estates Municipal Code (click here) has restrictions against R-1 zoned properties being used illegally by more than one family or as a commercial business venue. Desire Meli Kocarslan already has been issued against her a California Court injunction against illegal use of the property as an event venue (see below). Asli Uzumcu: The daughter of Desire Meli Kocarslan and sister of Selin Uzumcu appears to be a pathological liar. This view is based on her proven willingness to make false, unsubstantiated statements to the District Attorney/California Courts in order to bring harm to her mother’s neighborhood adversaries. In late 10/2015, after catching wind of the community joining again to compel the City to prosecute her mother Desire Kocarslan for the illegal commercial use of 605 Paseo del Mar for wedding and other events, Asli Uzumcu filed a petition in the California Superior Court making claims of needing a restraining order against the Anastassiou brothers living across the street. Claims made by Uzumcu includes that one or both of the never-married James and/or Thomas Anastassiou were staring out their window (lewdly?) at the young scantily-clad-at-times (see photo) girl. The judge, reportedly after threatening to throw mother Kocarslan out of the courtroom for coaching her daughter’s answers to the judge’s questions, saw through the charade and dismissed the petition. Then, in 06/2018, Asli Uzumcu went into high gear once again, sending an e-mail to the Deputy District Attorney replete again with false, unsubstantiated allegations of criminal activity by yet another neighbor just a few homes up from the Anastassiou residence. 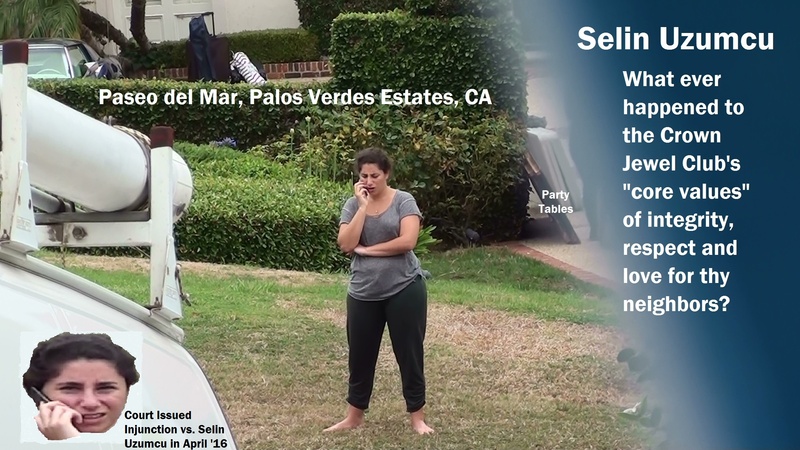 Again, despite a total absence of evidence connecting neighbors to alleged crimes, Asli and her sister Selin appear to hesitate nary a moment to register knowingly or recklessly false criminal allegations against neighbors who have opposed her family’s proven, repeat illegal operations at 605 Paseo del Mar. IF YOU ENTER INTO A LEGALLY BINDING RENTAL AGREEMENT, VERBAL OR IN WRITING, TO RENT OR OTHERWISE UTILIZE 605 PASEO DEL MAR, PALOS VERDES ESTATES, CA 90274, FROM DESIRE KOCARSLAN, RICHARDSON & DIRECTORS OR ANY RELATED PARTY, FOR ILLEGAL/NON-PERMITTED USE AS AN EVENT VENUE, YOU SHALL HAVE RELINQUISHED ANY AND ALL OPPORTUNITY TO SALVAGE YOUR WEDDING OR OTHER EVENT FROM STRICT LAW ENFORCEMENT BY THE LOCAL POLICE DEPARTMENT, AND FULL PROSECUTION IN A COURT OF LAW, UNDER THE LAWS OF THE STATE OF CALIFORNIA AND CITY OF PALOS VERDES ESTATES. A COURT INJUNCTION MAY ALLOW THE POLICE DEPARTMENT TO INTERRUPT YOUR EVENT/WEDDING AND FORCE ALL GUESTS TO LEAVE THE PREMISES. “All those persons who allow, assist others to use, and who actually use the above property for any unpermitted use may be subject to civil and criminal penalties, pursuant to PVEMC sections 17.32.050 and 17.32.060.” (click on PVE Legal Notice below). 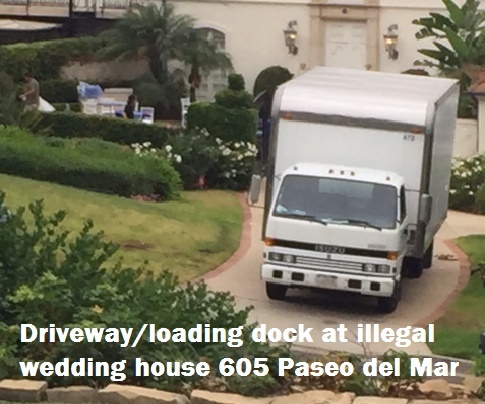 In addition, PVEMC Section 18.42.030 (E) – Visitors, customers or deliveries shall not exceed that normally and reasonably occurring for a residence – shall lead to further prosecution of 605 Paseo del Mar renters using it as an event venue. Melahat Uzumcu/Desire Meli Kocarslan has been on legal notice for the majority of a decade; CLICK ON THIS GRAPHIC !!!! CLICK ON THIS GRAPHIC !!!! DESIRE MELI KOCARSLAN DEBT PROBLEMS? According to a June 2016 title report, in addition to a $4,000,000 Chevy Chase Bank mortgage on the property, Kocarslan owed over $100,000 to two different lawyers and was delinquent on her 2015-2016 property taxes. 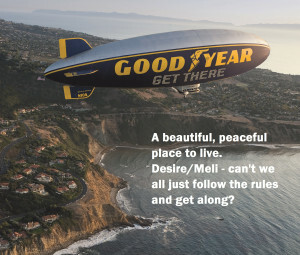 Desire Meli Kocarslan’s neighbors around 605 Paseo del Mar, Palos Verdes Estates, want to live in peace and harmony alongside her. For over a decade, this simple goal has proven to be extremely difficult to accomplish. Over the years, various neighbors have engaged her in acts of friendship and neighborly kindness, only to be punished therefor. The only goal of this website is to bring peace to our neighborhood by assisting the cessation of illegal rental activity at 605 Paseo del Mar. 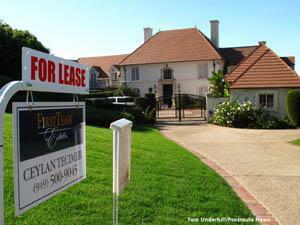 Any and all legal, non-event venue rentals not only are unopposed by various neighbors, but in fact we find nearly any other legal tenant a highly likely improvement over Ms. Kocarslan herself. 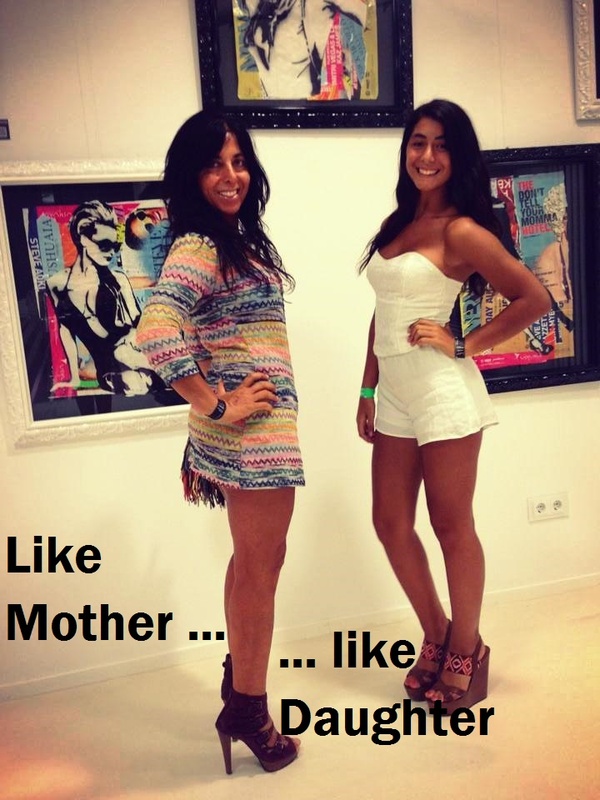 Desire Kocarslan’s neighbors wish she would adopt the “core values” of “Integrity”, “Respect” and “Love” espoused by her daughter Selin Uzumcu, Social Media Manager of the Crown Jewel Club in Los Angeles (for Selin Uzumcu LinkedIn page click here). In September 2009, the State of California sued Melahat Uzumcu (aka Desire Meli Kocarslan) over her illegal rental of her residentially zoned property as a commercial event/wedding venue. The four count complaint cited violations of the Palos Verdes Estates Municipal Code (Case No. 9SY08502; Judge Hector M. Guzman recused himself from the case and on September 29, 2009 transferred it to Judge Sandra Thompson). The media picked up stories of the lawsuit, including NBC LA Channel 4 and flyover helicopter coverage by KTLA Channel 7 News (click here and see photo from helicopter below). A resident faces fines and jail time for renting her house for loud receptions. § 18.04.010: Melahat Uzumcu (aka Desire Kocarslan) , in the R-1 single-family residence zone, did cause or permit the 605 Paseo del Mar to be used as an events center, a nonpermitted use. 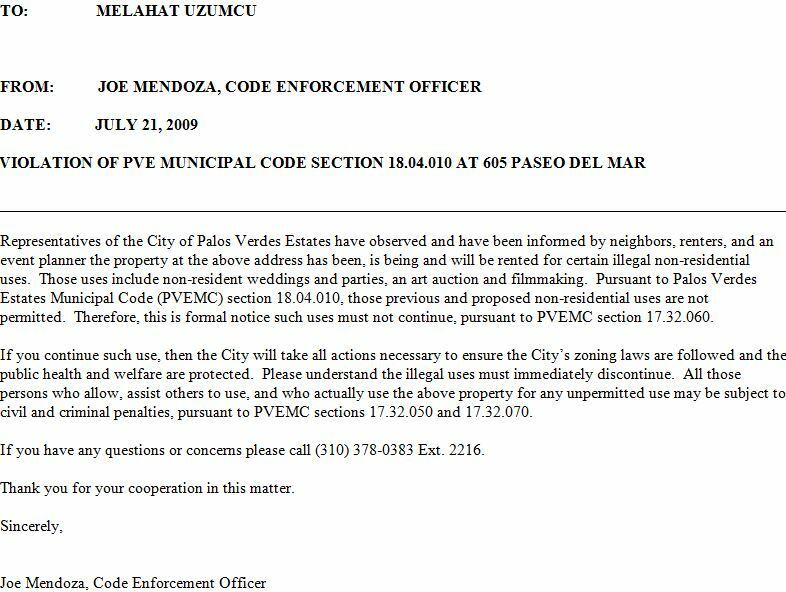 § 17.32.060: Melahat Uzumcu (aka Desire Kocarslan) did maintain a public nuisance by having a building or structure used In a manner contrary to the provisions of Title 17 and/or Title 18 of the Palos Verdes Municipal Code. § 5.16.010: Melahat Uzumcu (aka Desire Kocarslan) did conduct a business within the city, to wit, a commercial events center, without first obtaining and thereafter maintaining a business license pursuant to the provisions of Chapter 5.16, and paying the tax therefor. Uzumcu told Judge Alan B. Honeycutt she had been unsuccessful in obtaining an attorney because “my name and my house are all over the media.” She requested another continuance, at which point Honeycutt suggested sometime after Jan. 1, 2010. Haubert rejected the request saying that was too long a time period and asked to have the case heard sooner. “It’s not uncommon for someone to ask for time to get an attorney, but, in my opinion, three weeks was ample time,” he said. “I was surprised she did not have an attorney and I would advise her to get an attorney — I think she should seek legal help.” Honeycutt stated that this would be the last time Uzumcu’s case would be continued. Between now and Dec. 15, she must find an attorney, settle out of court or choose to represent herself. Uzumcu asked to apply for a public defender; Honeycutt said she could apply but, “seeing as how you own your home in Palos Verdes Estates, I suspect you will not qualify for a public defender,” he said before asking her if she would still like to proceed with her application. “Since this is the first time in my life that this has happened, I would like to give it a try,” Uzumcu said. However, court documents dating back almost 10 years show that Uzumcu has faced several other trials for a range of charges, including breach of contract, fraud, domestic violence, burglary and theft of property. Uzumcu was not interested in speaking with the News. She is being charged with violating the city’s zoning code, conducting a business without a license and creating a public nuisance. If convicted, she faces a maximum $4,000 fine and — although unlikely, according to Haubert — up to two years of jail time. All of the information on this site was obtained from public sources (e.g., County and State court and other records) or provided voluntarily to sources of the site by parties mentioned herein (e.g., Natasha Cleveland or other renters of your illegal event venue). Should you have written evidence that any false statement exists on this site, you are encouraged strongly to contact the site immediately in order for such provably false statement to be removed or modified into corrected form. You are encouraged to provide, via E-mail to neighbor@605paseodelmar.com, a signed, notarized affidavit exclusively disputing accusations made against you or related parties. Such affidavit then may be made available on this site, allowing the public to consider “your side” of the story. This web page and related posts and commentary represent both publicly available and direct witness/participant facts and personal opinions, as protected by the First Amendment to the U.S. Constitution. Comments made by third parties, in the Comment Section below or elsewhere, represent commentators’ own representations of facts and own opinions. Asli Uzumcu and her sister Selin Uzumcu are up to no good yet again. Making knowingly and recklessly false statements to a California District Attorney’s office can get someone in very hot water. I actually feel bad for both young women in a way. Their criminally prosecuted mother has taught these girls some bad tricks of their trade. This Selin pictured above? Is she a linebacker for the LA Rams or instead working for Ward Howell, the washed up, has-been recruitment company? Whoever dropped off that flash drive with the photo files, can I request another one delivered and that I can screen print the photos for delivery to enforcement? Anyone else see Desire Kocarslan’s beat up car broken down on PV Drive North? It looked like it died and she, wearing a silly cowboy hat, had a cone in front and behind her card, blocking traffic in left lane. What a shock that something she is supposed to maintain is broken down? 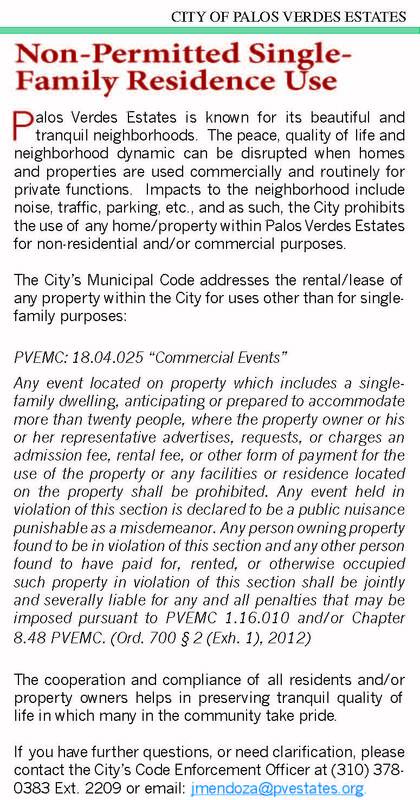 In 2012 PVE passed a law limiting head count to 20 for events at a residence accepting a fee or rent (http://www.codepublishing.com/CA/PalosVerdesEstates/#!/palosverdes18/PalosVerdes1804.html#18.04.025). 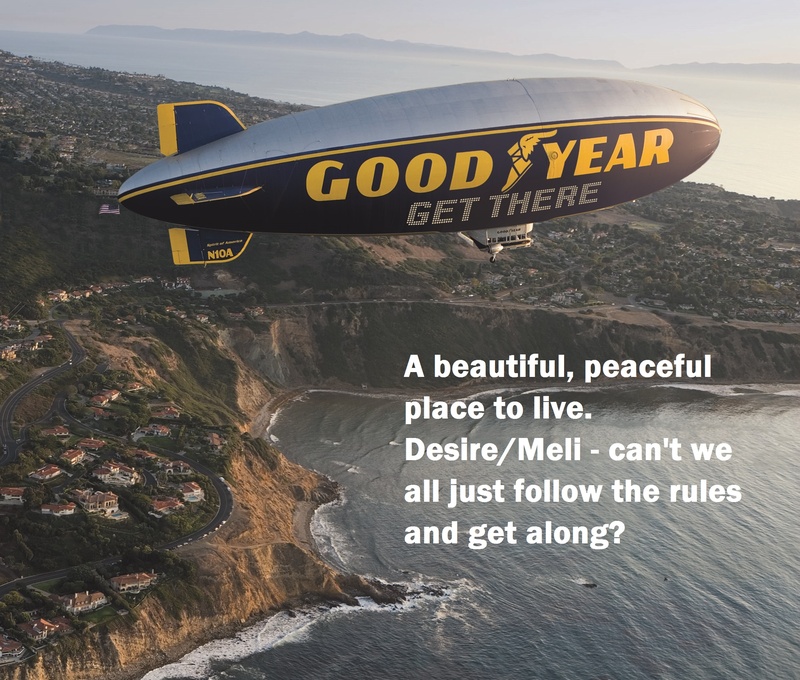 However, click here to see Meli or Desire or whatever she calls herself now telling a potential customer that for guests, on top of 12 staying overnight in the house, “30 is fine”. Thus, she is giving guidance that 42 is fine, over twice the legal limit. What a piece of … uh … work. At the risk of celebrating prematurely, did the City actually follow through on its commitment to prosecute Desire Kocarslan for her illegal activities? Enquiring minds want to know. Just ask Jimmy Anastassiou if you want confirmation. IN-JUNC-TION, Baby! NO, it appears the City has not followed through on its commitment to prosecute Desire Korcarslan for her illegal activities. Infact, she has continued renting out her home, listings on HomeAway, Airnbnb, etc…One family rented the Chateau Del Mar this past April 2017 thru June 2017 @ $3000 per day totaling $90,000. & this past weekend rented to another couple for 2 nights @ $1700 per night. Asli and Selin Uzumcu Following in Mommy's Footsteps on Chateau del Mar – 605 Paseo del Mar Illegal Detox Center?